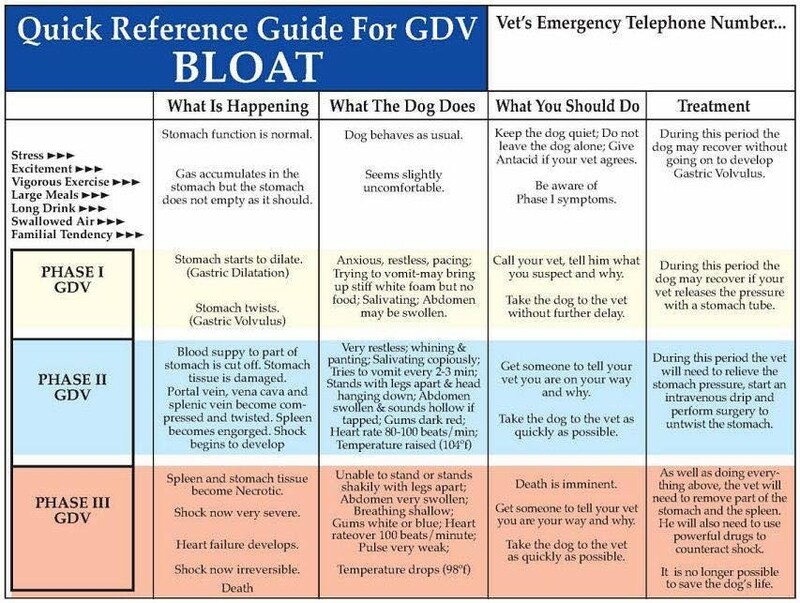 Bloat is a true emergency, your hound could die from this and you will need to get them to your vets immediately! When at the vets you will need to get the hound pain relief and on a drip before anything else is done or discussed, it is very important to get the fluids from the drip into the hound immediately to counteract the hound going into shock, when the hound is stabilised a course of action can be discussed, the vet may x-ray, but if they need to operate then it probably is not necessary to x-ray, the vet will attempt to aspirate air from the stomach by tubing to relieve the distension, they will try and tube the hound before operating, however sometimes the tube will not go down properly, this can be due to a narrow passageway otr the stomach maybe twisted preventing the tube entering the stomach. If your hound is operated on this will last at least a couple of hours, sometimes the stomach has not twisted it has just blown up, whatever has happened a gastropexy is advised whilst they are having the operation done. This can help prevent twisting if there is a further occurrence of bloat. After an operation you will need to be careful with feeding, 4 very small meals a day, then proceeding to 3 as the meals get slightly larger, chicken and rice is a good food or chappie, feeding tripe and the original dry food but soaked to help reduce any more instances and to make it easier to digest. Hounds are at a greater risk of bloating once they have already bloated. You know your dog, if your vet tells you that your dog is not bloating but you feel the dog is in discomfort insist that your dog gets a painkiller injection. Too many times a dog has been turned away from a veterinary surgery to then later die of bloat because the vet was not convinced that the dog was bloating.